Having been away from my computer for an entire week now, I realise you will be expecting me to return with something very bright and wickedly insightful. Well, friends, prepare to be not-disappointed. I have traveled around a bit in the past week and I have looked carefully at things and, as you quite rightly expect, I have reached a conclusion. Many of you have simply not come to terms with the concept of Widescreen TV. Don’t get in a huff now, don’t ‘hump off’ with that ‘face’ on you. This is simply the fact of the matter and you might as well face it now as later. So, let’s face it together. You remember when you all went out and got these widescreen TV’s? Mostly, it must be said, because your old telly blew up in accordance with the laws of built-in-obsolescence and you couldn’t find another square shaped one to replace it. Fine, so here you all are now with your wide screen tellys and my observation is that a considerable percentage of you have not the first feckin’ clue how to use them. Which is sad, really. I’ve always been in love with the concept of widescreen. We ’see’ in widescreen, after all and the movies have, for the longest time, recognised this fact and given us the marvellous wide experiences which our brains covertly desire. Telly screens were only ever box-shaped on account of technological shortcomings which I won’t go into here mostly because I don’t have a clue what the hell they were. I remember once journeying to Harrods on the strength of a rumour that they had a widescreen television on display there. That wasn’t today or yesterday, I can tell you. Well, let’s be blunt, it was a bloody long time ago. Widescreen has been with us for a long time now yet still the widescreen telly in the corner of your room is not doing what it should be doing and, guess what, it’s all your fault. Stick around and I’ll tell you why. I tend to get quite anxious about screen-ratios. It’s definitely one of my foibles. I get upset when the correct proportions are not applied to the film or programme I am watching. I get itchy. Only yesterday, I was in a fine cinema watching ‘Super 8’. I had made a special journey to see it there and I was excited to do so and very very pleased with what I saw. More on that in a minute. But, before the main feature, the adverts and the trailers where all projected onto the screen in a different ratio to the screen on which they were being shown and I was edgy (really) that the main event was not going to fit the screen. Had that been the case, I would have sought out the projectionist and had a chat with him about it. That’s the kind of thing I tend to do. A lovely lovely film. Go and see. Now… about those tellys of yours. Here’s where you most likely went wrong. Back when you got your spanking new widescreen telly, you embraced the concept wholeheartedly, didn’t you? You said, “Right, now we’ve got bloody widescreen, we’re going to have everything in widescreen.” And you twiddled with your telly until everything on it looked widescreen. The trouble was – and still is – that not everything is widescreen. These days, almost everything is but there are still a few throwbacks to the old 4:3 screen ratio of your old Bush (no, ‘Bush’ was a model of TV, missus). You hated to see any black bands on the side of your screen when a 4:3 ratio programme came on your shiny new telly so you ‘fixed’ them, didn’t you? You zoomed and stretched the picture until the entire tube was filled with glorious widescreen content. But, look carefully, it’s all Kak, isn’t it? That lady's’s right shoulder is twice as wide as his left one and the titles of the programmes are shooting out the side of the telly and into the curtains. Your telly picture looks crap and it’s all your fault. You can fix this. I’ve done it to three tellys as I mooched around this week. (And when the owners find out they’ll probably kill me). Here, in fairly general terms, is what to do. First, are your settings actually wrong? Let’s see. Find an old episode of ‘Friends’ on some channels, More4 or something. Let’s face it, it’s not hard to do. ‘Friends’ was made in 4:3 format so you should have black bands on the left and right of the screen on your widescreen telly. If you do, you’re probably okay. If you don’t then you, or some other git, has stretched your picture to fit the telly and it looks crap. Set your Sky Box or whatever you have to output in 16:9 format. I don’t know where the setting is, what am I, Handy Andy? Go and bloody find it yourself. When that’s done, go into your telly settings and set the zoom to ‘Auto Zoom’. Then it will zoom in and out all by itself to give you the optimum viewing experience. It’s worth it. Correctly set widescreen is wonderful and incorrectly set is the exact nemesis of wonderful… whatever that is. If my instructions are too vague and, yes, of course they bloody are, then do a little internet research or get your son or idiot cousin to sort it out for you. It’ll take them ten seconds and the self-satisfied sneer they will surely impose upon you will be entirely worth it on account of your improved telly-viewing experience. Go and do it now. I think you're actually talking about getting Google+ or New Twitter to work, Ken. PS I find wide screen tv's as impossible to use as Google+ and New Twitter. I may go back to Facebook. And a not-widescreen tv. How timely. 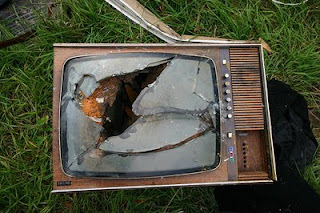 Just bought a new telly (for the first time in my life, I might add) three days ago. Now, if I can wrestle the remote off the children, and provided the dogs haven't buried the bleedin' thing in the back garden, I will follow your instructions to the letter. I was once told by the film reviewer Alan Frank that if the film was not focussed properly in any way on the screen, then customers are entitled to demand their ticket money back. This is some kind of .. law, I think. Except... broadcasters get it wrong too. BBC News fills the screen when it features clips in obits, never mind if their zooming in cuts off the head of the deceased. And channels such as CBS Action have gone to some trouble to produce widescreen versions of old shows. The original Star Trek is played out there in widescreen and it's wrong but gorgeously clear instead of pixel-doubled blurry. Last, my TV has a "smart" setting which detects the change from 4:3 to widescreen and adjusts its trouser belt to match. Except when it doesn't. So I'll do it manually and then it's a-ha, user has made positive choice, I mustn't try to get it right ever again. Yup, William, quite right. My mission here was appraise the Masses... well the Forty... that they're settings might be wrong. There is no accounting for the channel-to-channel foibles which crop up (crop, geddit??). I see to be in a minority who can spot a bad screen ratio in a flash and I *have* to manually fix it. I reckon you're in this boat too so I feel a bit steadier now. It's beyond me how people splash out on these fancy TVs and then spend years with incorrect settings. Clearly there needs to be some sort of leafleting campaign to remedy this. Of course then there’s wide screen and there’s wide screen. My last TV was supposed to be a wide screen and frequently there were people hanging off the edge of both sides and nothing I could do would adjust the picture to include everything that was clearly there and I have the same problem with my brand spanking new HD ready TV the setting of which are so easy to access and flick through. The problem I have concluded is to do with the broadcasters and I find it hard to believe that, in this day and age, they haven’t got their act together. On the whole I’m not that fussed. Frankly I can’t tell the difference between high def and the bog standard stuff I’ve been watching for years and you will never get me buying a 3D TV. Now, I’m not one of those people who still argues that LPs are better than CDs and I’m happy to concede that the world is not flat but I cannot see what the fuss is all about when it comes to 3D. There was a time when there were no pictures and we all had to read about what was going on and a part of me wouldn’t be the slightest bit upset if we had to return there. This may shock you... but I have never seen a wide screen TV except on commercials selling them. I have even done tech support for people with widescreen TVs. Ironic, eh? Laura: Not shocked but you *Are* a constant surprise and this does surprise me. I wonder is your computer monitor not widescreen? I realise this puts me firmly in the old fogies section of the audience, but I remain firmly committed to the idea that the tv is for the 4 terrestrial channels only (yes, 4 - the valley where I live has never let channel 5 join the tv club) I don't have satellite, digital or any other sort of transmition and I'll probably end up throwing the tv out of the window on the day of digital switch-over.